Is James Murdoch a surfer? There's something about his voice - the way it lilts upwards at the end of his sentences. I speak, of course, of today's grilling of the Murdochs, senior and junior. See @frugalspeech on Twitter for some thoughts. Does anybody know how Twitter works? Since taking the Twitter plunge the other day I find that I'm following a bunch of people without any idea how this occurred. Don't get me wrong - I'm sure they're all very nice - but how did the people at Twitter make this happen? Meanwhile, I'm three weeks post breaking ribs, and improvement is negligible. I think the ferry crossing back home from Santander to Plymouth, over the Bay of Biscay in a force four to five, started to undo my recovery, then back here a mild cold, and consequential sneezes and coughing, finished me off. Sleep remains all but impossible, pain is constant and not much fun, the News of the World is no more, Rebekah Brooks has gone as News International's CEO and it's all very distressing. When I broke the ribs originally, I consoled myself with thoughts of being back in action within six weeks, in the knowledge that the Murdoch empire would continue to shine its light upon the suburbs of London, but now I can see that this won't happen. It'll be more like ten, by which, at this rate, there won't be a single executive left in Wapping. "That Wade bloke has just had serious surgery, but chances are he'll return to surfing and boxing in due course. However, he is a menace, not just in the line-up but in clubs, bars, bedrooms and wardrobes up and down the land. He thinks no one knows about his pecadilloes, about his former life as a newspaper lawyer, but he forgets that we are gods who live on Olympus most high. We can see everything, we know everything, we are everything, to ourselves especially, for that's the way with gods most high, we're a fairly self-regarding bunch who like to impose absurd and ludicrous penalties on people for no good reason other than that they might have offended us in some arbitrary way. We turn them into swans, give them five extra legs, make them eat yellow lorries and perform ridiculous Herculean labours, and in Wade's case, we are offended by his reactionary attitude to teenage substance abuse, by his delusional belief in QPR football club, by his belief in Article 10 of the European Convention on Human Rights and by his propensity for self-destruction. Thus it is that we have decided to punish him by ensuring that he breaks his ribs and suffers an inexplicable injury to his right thigh at the same time. This will keep him out of the water, out of clubs and bars and away from bedrooms and wardrobes. We will then force him to read the Daily Mail every day, and to pen a letter to Paul Dacre saying how much he would like to be him." And so, dear readers, here I am, about to sit down to write to Paul Dacre. But I can't find the right words. Instead I find myself publishing these skate pics of Harry and Liam in Somo skatepark, courtesy of Mr Ocean Image. Where will it all end? I don't know. But one thing's for sure. We'll hear it first on Twitter. Women deserve to be recognized and NAPW wants to do just that. We have hand selected you for inclusion in the 2011 edition of amazing_women in business. We are eagerly awaiting for your biographical profile, and are reaching out to you again so you dont miss this really unique opportunity. NAPW_history dates back more then_100 years to a time when the accomplished and distinguished were featured in a publication that defined high society. In present day, the NAPW_provides a useful resource for women to excel and be recognized for their achievements in business and academics. Please accept our invitation so you can take advantage of all the amazing opportunities. A modicum of investigation reveals that the NAPW is the National Association of Professional Women. Naturally, I am honoured, flattered and excited to be recognised, at long last, by the NAPW. For years I have wondered if, because I am a man, albeit an accident-prone one, they would continue to ignore me, but mercifully they have abandoned their ridiculous and discriminatory 'girls only' policy, the sort of thing that we can all agree is absurd in this day and age. But lest you think that this is good news for all men, everywhere, it is not. You see, dear readers, while proving my womanhood may have taken a while, at least my professionalism was never in doubt (Er, that is not strictly true. Consider, if you will, your behaviour during the Wrecking Machine years. And the other night in Penzance, too. Ed.). If you too believe that you are both professional and a woman, don't let being a man stand in your way. Apply to the NAPW now. Pictured: my mate Adjutant James Cunningham of the French Foreign Legion. James was born three days after me but our lives took different paths. He joined the Legion, I went into the law; he stayed where he was, I came out of the law again. Still James stayed in Le Corps Etranger, while I went back in to the law, then came out again and now somehow make a living out of writing. But tough and admirable though James may be, only one of us has been invited to join the National Association of Professional Women. And it wasn't him. Ha! At last, I have bowed to the inevitable. Yes, I bought a souvenir edition of the News of the World. It had been calling me all day, and I finally crumbled. "Thank you, and goodbye," was what the newsagent said to me, when I left his shop. "What do you mean by that?" was my reply, for I am nothing if not inquisitive. "I mean to say, is it true that you once worked at the News of the World?" said the newsagent, beaming menacingly. "I know nothing, even if I did, but I don't know whether I did," said I. "Thank you, and goodbye," were the newsagent's last words. I then logged on to Twitter, in a new media kind of a way, and suggested that if you find these things interesting, you might care to buy the latest issue of The Surfer's Path, for in it appear a series of words, in reasonably coherent order, by my good self on whether surfing has spawned a discernible literary tradition. "Thank you, and goodbye," tweeted the newsagent, for like me he has just signed up to Twitter. I no longer recall what his Twitter address is, and I am such an ingenu that I don't actually know what I'm supposed to call mine, but it might be Alex Wade @SurfNation1. Or maybe it's just @SurfNation1. I don't know, but no doubt all, rather like the mire that is the News of the World phone hacking scandal, will soon become clear. Clear also is that I have just returned from the strangest surf trip of my life. Regular readers will recall that I was recently in Cantabria, Spain, where I was impressed by the quality of the local set-ups, the curves of the brand new skate park and the taste (and price) of the Rioja wine in the big and shiny and glistening supermercado. I was there with Aerial Attack, my son Harry and his mate Liam, all of whom got a few waves, albeit of the small and summery variety rather than the gnarly and memorable kind. But I didn't even go near a board, having broken two ribs just days before the trip. I did manage a very gentle swim, but that was it. The ferry ride home, from Santander to Plymouth, was a challenge given the rough weather, and back home I have found that having a mild cold is also of no assistance when one has broken ribs. "One sneezes, and one is in pain," as a famous tweet has it, but this is as nothing compared with the searing and burning that afflicts my right thigh every night. It's fine during the day and then the moment I lie down to go to sleep all hell breaks loose. I saw my GP and he reckons I have some kind of internal bleeding, but I am not so sure. "Goodbye, and thank you. If I ever get better again, life will be grand. Meanwhile I am interested in suggestions for a new strapline to this blog. 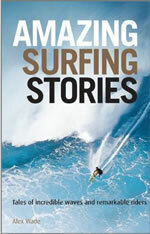 For example, 'A Surfer's Battle to Beat his own Uncanny Ability to Self-Harm', or some such. Please help." But the clever man at Twitter said that was over the 140-character limit, and that I had to be more clever. Or cleverer. "Thank you, and goodbye," said the newsagent. The non-surfing surf trip continues but with some interesting developments. It transpires that the area of Loredo and Somo, here on the Cantabrian coast, is the recipient of 3m euros of investment over three years by the Spanish government. That's 3m euros to go towards surfing. Yes, surfing (though the superb skate park in Somo, completed just a few weeks ago at the end of year one of the investment programme, is also a beneficiary). This explains the buzz in the area, the profusion of surf shops and schools and the array of holidaymaking surfers. The vibe is a bit like Watergate Bay in Cornwall, only with gauranteed hot weather, some killer reefs and seven times the size. Meanwhile, I find myself falling prey to the classic injured surfer's dilemma. On the one hand, selfless as I am, I want Tup, Harry and Liam to score pumping surf and heaps of great waves. On the other hand, I want it to be as flat as possible so that even though I have a couple of broken ribs and physically cannot surf, it doesn't matter, for of waves, there were none. Meanwhile, pictured here courtesy of Ocean Image, Liam Keogh is looking thoughtful, while the Cantabrian scenery inland proves diverting. Pictured above and below courtesy of Aerial Attack is Harry, who, along with his mate Liam , is in seventh heaven here in Somo even though the surf is pequeno. The lads have discovered Somo's superb skate park and its welcoming locals. They spent about 10 hours there yesterday and look set to do the same again today. Harry nailed his first acid drop and Liam skated well, too; I wonder how much they'll have improved after a week's skating here. We're here courtesy of Errant Surf. I'm not sure if Errant make much of the Somo and Loredo skate scene, but they should. It rocks and provides the perfect option if the surf is flat. For yours truly, the trip is both painful and poignant. It's a week to the day since I broke two ribs and they continue to hurt like hell. Because I have to sleep on my back, sitting upright, my addled, spinally compressed nerves are playing up and for the past three nights I've had a horrible burning sensation in my right thigh. It goes when I'm up and about but what with this development and the ribs, the nights are no fun at all. The trip is poignant because while it's great to see Harry skating so well, it reminds me of my youth and days spent skating bowls back in the 80s. Then, I could spin 360s on the walls of bowls and fakie back down, bust slick frontside grinds and ollie onto vertical walls. Now, with titanium in my neck and a pair of broken ribs, I have trouble climbing stairs. But still: once a skater, always a skater. Pictured below I am cruising at very slow speed in the Somo skate park. A fall, and my ribs would possibly puncture a lung. Luckily, I didn't fall. Greetings from Spain. I am here on a surf trip with a difference: it will not involve any surfing. Not for me, at least. Aerial Attack, my son Harry and his mate Liam will all get some waves - in fact, they have already had some - but none will come my way. None at all. Zero. Zilch. Niente and nada. I will be returning to England with not a single Spanish wave ridden. The reason for this parlous state of affairs is that I broke two ribs just before leaving. Now I am something of an expert when it comes to surfing in the teeth of medical advice, but this time round it just ain't going to happen. I can barely walk at the moment, and just bending over to tie a shoelace, or adjust my flip-flops, or pick up a £20 note, or even, for yes, this sometimes happens, to inspect the pavement - is hell. I have to sleep sitting up, because when you have broken ribs you can't lie flat, and each night for the past six days I have had awful nights of barely any kip and heaps of pain. All in all, therefore, if I thought I was the Opposite Of On It in a previous post, now I am not even the Opposite Of On It. I am so far from being on it that to suggest that I could even be off it is risible. But wait, I hear you cry, how did you come to break your ribs? That, dear reader, is a long story. Suffice to say, for now, that it did not entail the contravention of any laws. All is not lost. The accommodation provided by Errant Surf here at Loredo is superb, the weather is great and there is a top skate park in town. I accept that broken ribs means no popping up on surfboards, but will they stop me having a skate? Hell no. The evidence will be posted forthwith. Meantime, it's Vaya Con Dios from El Ribo - the man who won't be riding any of Loredo's nice waves on this trip.